"See that iPhone over there? Break it for me. 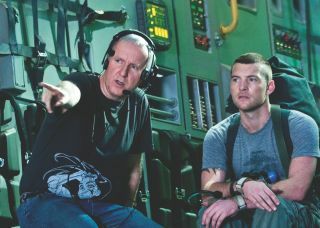 Break it for me now"
Director James Cameron has been speaking about the upcoming April Blu-ray release of Avatar, where he explained his dislike of watching movies on a small screen. At the Avatar Blu-ray press conference, he announced that the best way to watch the movie was in 3D, despite the film not being available on the Blu-ray 3D format until November. He doesn't, however, recommend watching the movie on the Apple iPhone. "I don't feel that I'm making movies for iPhones," he explained. "If someone wants to watch it on an iPhone, I'm not going to stop them, especially if they're paying for it, but I don't recommend it. "I think it's dumb, when you have characters that are so small in the frame that they're not visible." And it's not only phones he has problems with, but laptops too. "To me, there's a limit that you wouldn't want to go below," Cameron noted. "I don't know. I've never watched Avatar on a laptop. I guess it probably works, but I don't recommend it. "What I recommend is getting the coffee table out of the way and sticking your couch about four feet from your TV." Cameron and co are hoping that the non-3D release of Avatar will plug a hole until the 3D Blu-ray version hits the shelves this winter. To make it more appealing, there will an 'interactive' Avatar programme that consumers can join – a code will be given with purchases. This will bring first-look bonus materials, special content and money off the 3D version of the movie. Cameron explained the reasoning behind the lack of 3D Blu-ray, saying: "There just aren't that many players and screens yet. We have more of a long-term strategy, in that area. "But, I think it would be a shame to hold back the Blu-ray when people want it now, and I love it. I think it's a great format." He also gave some sage advice of how you should watch 3D in the home, telling the journalist-filled audience: "If you're going to go 3D, go big. Get the biggest set you can, and then sit as close as you can stand. "That's my advice. Get the coffee table out of the way and slide the couch over, right in front of the TV."